After his visit to the United States, Chinese President Xi Jinping will pay his first state visit to the United Kingdom next week, in what will be the first such presidential visit to the U.K. in ten years (the last one was former president Hu Jintao’s trip in 2005). As preparations for the trip took place, British Prime Minister David Cameron and Chinese Foreign Minister Wang Yi used the terms “golden year” and “golden age” to describe the current China-U.K. relationship. During his recent five-day trip to China, the U.K. Chancellor of the Exchequer George Osborne tweeted that “China and Britain stand on brink of golden decade of cooperation.” What exactly can we expect the bilateral relationship to be like after Xi’s state visit? How golden can the full picture be in reality? The first and most important aspect of the current China-U.K. relationship is economics. This is a result of more pragmatic policies by Cameron’s government and growing economic interdependence between the two countries. The U.K.’s relationship with China hit a rough patch in 2012 and 2013, after Cameron met with the Dalai Lama in May 2012. Opposition to the human rights situation in China and concern about how Beijing dealt with Hong Kong’s autonomy also has caused unease. Now, Cameron’s team has become pragmatic and is highlighting the positive side of the bilateral relationship – the U.K.’s decision to join the AIIB despite U.S. opposition serves as a good example. For now, both China and the U.K. are determined to make up for lost time. In particular, the U.K. sees its relations with China lagging behind those between China and Germany. In terms of economic interdependence, the U.K. is China’s second largest trade partner in the EU (after Germany), while China is the U.K.’s second largest non-EU trade partner. The U.K. also is the most popular destination for Chinese foreign direct investment in the EU, and it is China’s second largest source of investment in the EU. 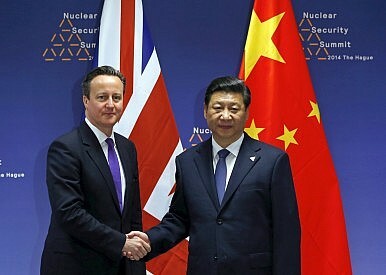 All in all, the golden elements of current China-U.K. relations are indeed tangible, namely goods and capital flows. Xi will be bringing a delegation of important business people with him, and big trade deals are expected to be signed. The Chinese side wants its railway, energy, aviation, and telecommunications industries to secure a foothold in the U.K. market, whereas the British side has its eye on Chinese financial markets as well as vast amounts of Chinese capital as a source of FDI. In particular, the city of London is demanding increases in Chinese investment in terms of both value and quality, especially commercial investment (as opposed to investment in property). The U.K. economy is currently performing relatively strongly, yet the growth does not seem to be stable, as demonstrated by the decision of the Bank of England not to increase interest rates from their lowest-ever level over recent months. As an open economy, the U.K. is always sensitive to international markets. Moreover, Cameron and his Conservative party have just secured control over the new government. They have to sustain the country’s economic recovery if they are to sustain their popular support. Given that reality, China and its market of 1.3 billion people and more than $3.5 trillion in foreign currency reserves is a crucial economic partner for the U.K.. In a recent round of interviews with fourteen national elites in London, as part of a research project conducted by the authors, British elites equated China with being a “huge market” and a “huge source of capital.” They hope that the city of London can become the financial center of renminbi trading in Europe, and they also hope that China will open up its financial services and capital markets to the British financial sector. Among Chinese economic sectors, the nuclear industry and the high-speed railway industry are among the most enthusiastic to seal business deals with the U.K.. Such deals would signify Western economies’ recognition of Chinese-developed high-end technology, thus marking China’s successful industrial transition from factories producing goods involving low-end technology to become a producer of advanced technology. In addition, the Chinese side will explain the recent depreciation of the renminbi and fluctuations in the country’s stock markets, so as to assure their British counterparts that the Chinese economy has the confidence to keep implementing reforms. For China, the U.K., with London as a world-leading financial center and with a government that already includes the renminbi in its foreign currency reserves, is a crucial partner for the internationalization of the renminbi. An agreement between the two countries to study linking the stock markets in Shanghai and London, for example, signifies strong will on both sides to bring bilateral relations to the next level. In terms of diplomacy, the arrangement of Xi’s trip as a single-country visit and having Queen Elizabeth II serve as the host (at Buckingham Palace) shows both sides’ earnest desire to boost the bilateral strategic partnership (which was established in 2004). As Chinese Foreign Minister Wang Yi stated, Xi’s visit will mark the start of a “golden age” of the China-U.K. relationship. Entering such a golden age means that the two sides are focusing mainly on constructive cooperation and common interests. Indeed, this trend can be traced back to the U.K.’s application – the first from the Western world – to join the AIIB. China sees not only the pragmatism of Cameron, but also a readiness for the bilateral relationship to become a new type of great power relations. Accordingly, controversial issues – namely the Chinese human rights situation, reforms of Hong Kong’s political system, and cyber hacking are likely to be relegated to the sidelines. Another issue at the top of Cameron’s agenda is the (re)negotiation of the U.K.’s membership in the EU. Unlike his last visit to Europe in 2014, which included four EU countries, Xi will only visit the U.K. on this state visit. To have China attach such importance to the U.K. can help London highlight its special international status and increase the U.K.’s bargaining power against Brussels. Boosting close ties with major global powers like China helps Cameron’s government to dismiss concerns about a decline in the U.K.’s global role, and thus strengthens its internal support among British citizens. Notably, Xi’s visit can truly establish a golden era in the China-U.K. relationship only if China and the U.K. recognize the fact that they do see eye to eye with each other. On the one hand, China prefers an integrated European Union that can serve as one major pole in a multipolar world, and so China prefers that the U.K. not leave the EU. On the other hand, China is aware of the different voices within the EU. China understands the U.K.’s worries and concerns about its EU membership and sees it as normal for a large group of countries like the EU member states to have divergent views and interests. The U.K. would risk a lot by actually leaving the EU, but the country retains more independence from Brussels by keeping a distance. Most importantly, the most significant bilateral relationship for the U.K. remains that with the United States. The U.K. is also unlikely to abandon the values and norms that make it part of the West. The aforementioned references to a golden year mean that China and the U.K. are deliberately downplaying their ideological differences. Yet differences in political culture and social values remain. A mature partnership requires both sides to respect their differences. While conflict is a part of international relations, today’s world is also highly globalized and interdependent. Mature partners like China and the U.K. send a positive message to each other and to the outside world that focusing on common interests is the key. As suggested by a majority of the British elites that were interviewed, a close partnership between China and the U.K. requires better mutual understanding than currently exists. Effective dialogue (instead of monologue) and candid exchanges of opinions are irreplaceable. Cultural and people-to-people exchanges, like the China-U.K. High-Level People-to-People Exchange Mechanism and the recently suggested idea of exchanging historical relics, are necessary for a comprehensive partnership, although the process is a long-term one. It is precisely because of the slow process of building trust that Xi’s meeting with Cameron should mark a concrete starting point. The pair should be proactive in promoting the “golden age” of bilateral ties, making the China-U.K. relationship an example for other countries. Shi Zhiqin is dean of the department of international relations at Tsinghua University and a resident scholar at the Carnegie­­−Tsinghua Center for Global Policy. Lai Suetyi is a postdoctoral researcher at the Department of International Relations of Tsinghua University. Xi Jinping in the U.K.